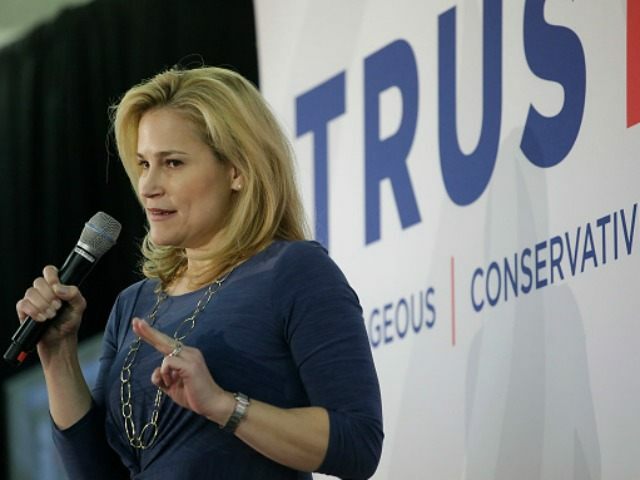 “Ted believes trade is an important feature of our economy that helps grow American businesses, creates jobs, and has tremendous benefits for this country,” Heidi Cruz said in a statement to Breitbart News. We make some of the best products and provide the best services in the world. No one can compete with American ingenuity and innovation. But Ted has said he will not support any trade deals that are bad for America or American workers. That’s why he opposes TPP and part of the reason why he voted against TPA. This administration cannot be trusted to do what’s right for American workers – and TPP is not a good deal for the country. If Ted is elected, he will fight vigorously for workers, to create jobs, and promote our economic interests. Sen. Cruz, when the Trade Promotion Authority (TPA) portion of Obamatrade came up last year in the U.S. Senate for the second time, voted against it. TPA is the portion of Obamatrade that would grease the skids for a variety of globalist trade deals, including the Trans Pacific Partnership (TPP)—a deal President Barack Obama just inked with several Pacific Rim nations including the Sharia-law run Brunei and child labor using Vietnam among other nations. TPP isn’t the only trade deal that TPA would fast-track congressional passage of by lowering vote thresholds in the Senate from 60 votes to 51 votes and by killing the ability of Congress to amend the deal. The Transatlantic Trade and Investment Partnership (T-TIP) and the Trade in Services Agreement (TiSA)—more parts of Obamatrade—would also be fast-tracked by Obamatrade’s TPA. President Obama’s team, along with 11 other nations, just signed TPP—informally approving the deal—in New Zealand. “Trade ministers from 12 Pacific Rim countries including the United States gathered Thursday in New Zealand for the ceremonial signing of a free-trade deal they say will significantly boost trade,” the Associated Press wrote about the signing. But for the pact to take force, each country must now ratify it through its domestic political process. Whether the politically divided U.S. will agree to it remains an open question. The agreement covers a region responsible for about one-third of all world trade, although noticeably missing from the agreement is China, which is forging ahead with its own trade deals. Proponents say the agreement will increase trade and make it more equitable by eliminating most tariffs and other barriers. But opponents say it will erode national sovereignty and hand too much power to U.S. corporations. China has expressed interest in becoming a part of the deal, something the administration has said they are open to as well—and something top Obama administration officials say they have discussed with the Chinese government. Cruz had originally backed TPA, but as revelations of connections between the program and immigration provisions among other concerns about protection for American workers came to light thanks to Sen. Jeff Sessions (R-AL), he changed course to oppose it. Heidi Cruz had been on the Vince Coakley radio program in Greenville, South Carolina, this week where she accidentally misstated Cruz’s position on TPA and trade policy. “Well Ted is a free trader, he’s always been a free trader, and that is why he voted for the Trade Promotion Authority in Congress,” Heidi Cruz said on the show. That being said, what is—and the reason he is for free trade is because it creates American jobs. We’ve done a study on the campaign as to how many jobs free trade has created for various states in the country, and the numbers are in the hundreds of thousands depending on the size of the state. And so I’d encourage your listeners to look at those types of statistics. Free trade creates jobs for Americans. Ted has integrated into his tax plan a tax break for exports so that companies that producing for export will not be taxed in the U.S. which gives them any advantage in selling abroad. Technically speaking, Cruz voted against TPA–so that prompted BuzzFeed to argue that Heidi took a different position on TPA than her husband has. But in the later part of the interview she made clear that her husband actually opposes the TPP. “The second thing, though, and equally important, they must go part and parcel, is that we must be negotiating the right free trade agreements that are good for America and not bad for America,” Heidi Cruz continued. And this president has not proven that he’s able to do so, and so Ted voted against the TPP, the deal with Asia. And the reason he voted against it is, he actually goes and reads the bills that he votes on and the agreements that are negotiated. Ted went down into the SCIF, he read through the pages of this agreement. He made the observation that this was not a good agreement for America. This president is not negotiating good deals for our country, there are immigration things in there. There are things that don’t belong in there, and he voted against that agreement. Heidi Cruz has become one of her husband’s biggest assets on the campaign trail—as she’s well-spoken and intelligent—so Ted Cruz frequently uses her as a top surrogate. Also in that Coakley interview, Heidi Cruz laid out her husband Ted Cruz’s faith is a central part of his message.